Never touch a dragon! / illustrated by Stuart Lynch. by Lynch, Stuart [illustrator. ]; Greening, Rosie [author.]. Material type: BookPublisher: Hertfordshire, England : Nashville, TN : Make Believe Ideas, Ltd., 2017Description: 10 unnumbered pages; colour illustrations ; 19 cm.ISBN: 9781786922670; 1786922673; 9781786928818; 1786928817.Subject(s): Dragons -- Juvenile fiction Genre/Form: Textured books.DDC classification: 823.92 Summary: You must never touch a dragon... except in this book! Meet the dragons in this funny rhyme that warns of the dangers of touching a dragon, and then ignoring the advice. On board die-cut pages with silicone touches. You must never touch a dragon... except in this book! 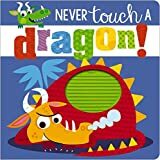 Meet the dragons in this funny rhyme that warns of the dangers of touching a dragon, and then ignoring the advice.